VICTORIA, BC – Phillips Brewing has announced the release of two new seasonal beers that are connected by colour, if not by style. 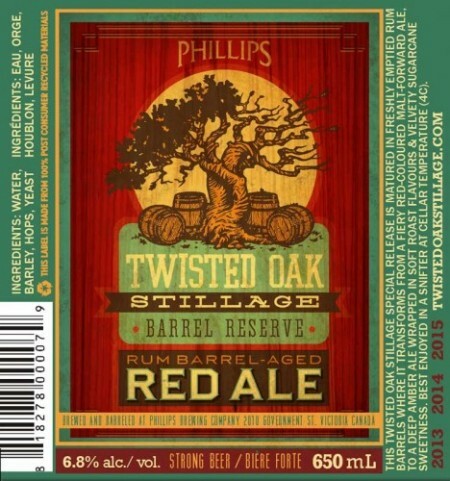 This Twisted Oak special release is matured in freshly emptied rum barrels, where it transforms from fiery red colour to a deep amber, and is wrapped in soft roast flavours and velvety sugarcane sweetness. It strikes quickly with roundhouse hop kicks that are balanced by a formidable 8.2% rich malt body. Ultimately this majestic beer, brewed deep copper red, is big enough to slay even the strongest thirst. A dual release party will take place the Phillips tasting room this Thursday April 11th from 4:00 to 6:00 PM, and both beers will be available in 650 ml bottles at select private liquor stores in BC and the Phillips retail store for a limited time.